For a mobile game to go viral in the iOS and Android markets is a huge success in itself, but for that same game to then go on to sell even more copies on the 3DS, a device with a fraction of the install base, is unheard of. This is probably a result of the comparatively small selection of games on the eShop allowing good games to shine, the hype built up from the mobile releases, and the fact that this is a game deserving of proper buttons. Whatever the specific reasons for its success, Gunman Clive is clearly doing something right. The game opens with a damsel in distress being carted away by horse, crying out for the stoic gunman, Clive, to save her. Anyone who's enjoyed the classic platformers will immediately feel comfortable with the game's tight controls and level design. A comparison to the Mega Man games can be made, as the enemies in Gunman Clive are placed in such a way to catch the player off guard, or to create scenarios requiring very specific and precise play in order to progress. Fortunately, this is pulled off without suffering from the broken difficulty of trial-and-error design found in many indie platformers. 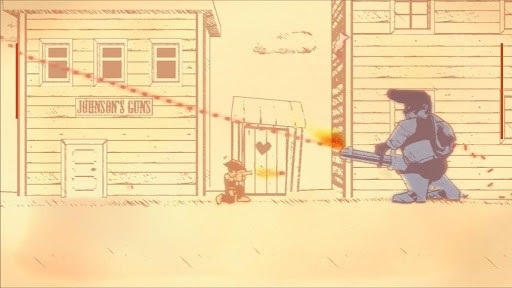 Gunman Clive is a shooting platformer, and as in Mega Man, players can only shoot horizontally, with a limit of 3 shots on screen at any given time. Powerups include a spread shot, homing shot, and a piercing shot. These are reminiscent of Contra and serve to liven things up. Taking damage causes Clive to revert back to his standard pea-shooter, and taking 4 hits of damage will send the player back the beginning of the level if they haven't reached the midway point. As in real life, health can be restored by eating cake. The game spans 20 stages in total, with each fifth stage dedicated entirely to a bossfight. Gameplay is varied, with standard platforming, a space-shootery segment, and even a mine-cart level. Difficulty increases gradually throughout, with no sudden spikes or drops along the way. Each boss has a unique attack pattern and nothing feels recycled. As mentioned before, the game isn't difficult in a broken way; it's just very tightly designed. This means that every death is a result of a clear mistake on the player's part, and creates a desire to master the game, making it easy to continue playing even after the twelfth consecutive death on the same section of a level. The downside of being very tightly designed is that there's not much incentive to play through it time and time again like one would a Mario game with all it's freedoms and secrets. The developer seemingly realized this however, and included two unlockable characters: Ms. Johnson, the aforementioned damsel, and a duck. That's right, the goomba of the game is a playable character. Ms. Johnson, the aforementioned damsel, can hover short distances using her dress (think Super Mario Bros. 2's Peach with a gun. The duck is an entirely different experience, as it has no method of attack, turning it into a completely passive game. Able to fly for short periods of time, it offers the most freedom of play in the game's tightly designed levels. Needless to say, there are no boss fights as the duck. Further extending the game's content is the addition of a Hard Mode, which cuts the health bar in half, and increases the number of enemies throughout. Gunman Clive keeps it short and sweet, coming in at a little under an hour for a single play-through. It does virtually nothing new, but it's hard to consider this a fault when everything it does is executed so well. It's an extremely solid platformer, and one continuous nod to the classics of gaming. At a mere $2, there is no reason not to play it. As mentioned in the beginning of this review, it's also available on iOS and Android, but the lack of additional characters, fewer levels, and, more importantly, the absence of tactile feedback make the 3DS version the definitive choice.